Over the years, historians have developed numerous theories about the subject of da Vinci's painting. Dan Brown's The Da Vinci Code first introduced me to the story behind the woman, but I must admit this take by Jeanne Kalogridis is backed by terrific research that makes Mona Lisa even more mysterious and spectacular. The charming and handsome Giuliano, younger brother of Lorenzo de Medici, was assassinated in the Duomo of Florence, Santa Maria del Fiore in 1478. Months after his death, Mona Lisa is born to a wealthy wool merchant and his wife, the beautiful but mentally unstable Madonna Lucrezia. As a young girl, Mona Lisa is welcomed with open arms at the Medici estate, where she meets Leonardo da Vinci and Michelangelo, and becomes close with Lorenzo and his young nephew Giuliano, named for his late uncle. It's not long before Mona Lisa falls under Giuliano's spell and captures his heart, much to her father's chagrin; after all, he believes Mona Lisa shouldn't associate at all with the Medici clan, thanks to his involvement with lunatic prophet Girolamo Savonarola, who vows to destroy the Medici family and their pagan ways. Shortly after her mother's untimely death at the hands of Savonarola, Mona Lisa makes plans to marry and live with her love, Giuliano. Unfortunately, conspiracy against the House of Medici prevents the couple from living happily ever after, and Mona Lisa learns of secrets that could derail the future of Florence and her lover's well-being. Just days after Mona Lisa is wed to Giuliano, he dies in battle. After learning of Giuliano's death, Mona Lisa succumbs to her father's wishes and marries the old, ugly, evil Francesco del Giocondo, who keeps Lisa imprisoned behind the walls of his home. It's there that Mona Lisa learns about her true background, and arranges secret meetings with Leonardo da Vinci to plan for a better future. 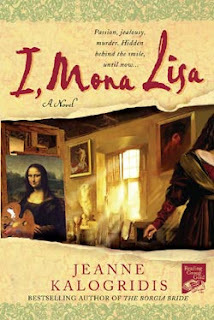 I, Mona Lisa is the first novel I've ever read by Jeanne Kalogridis. All 515 pages of this novel are completely engrossing -- it was difficult to put down. I took this book everywhere with me, reading it every chance I could. The story moves along quite swiftly; don't expect any lulls. I knew I loved this book when I took frequent breaks to Google some of the characters and events to learn more about them, particularly Lorenzo de Medici and Girolamo Savonarola. This is exactly why I love historical fiction; the genre is capable of opening your eyes and making you view history in an entirely new light. My copy of this novel features an interview with Jeanne Kalogridis, and her motivation behind choosing Mona Lisa as a subject. She mentions how the portrait of Mona Lisa was once extremely beautiful, and resembled nothing of the botched, overly touched portrait that exists today. I found her comments interesting because I've never really been moved by the apparent beauty of Mona Lisa, who to me, seems quite plain and unimpressive. While I consider myself a person who appreciates fine art, I've never quite fallen under the spell of Mona Lisa. But after reading this novel and comments by Kalogridis, I can finally see and appreciate the beauty of the world's most popular work of art for what it is. Do you read historical fiction, and if so, what are your favorite novels? Share your comments below!